Ludington State Park is pitched among a long stretch of sand dunes that shields it from Lake Michigan, which the park borders. Dunes here are a little different from those on the North Carolina coast. The first row of dunes, the equivalent of the “berm” on the N.C. island beaches, are mostly sand with some grass cover. They’re taller than the dunes at our coast. 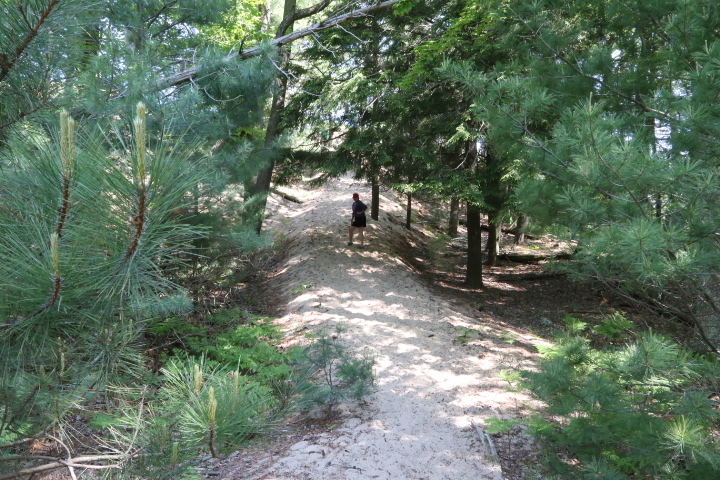 Behind the first row of dunes are large, wooded hills, which, it turns out, are also dunes. There’s a thin layer of what you might call soil, which supports abundant plant life. But underneath that is a big hill of sand. 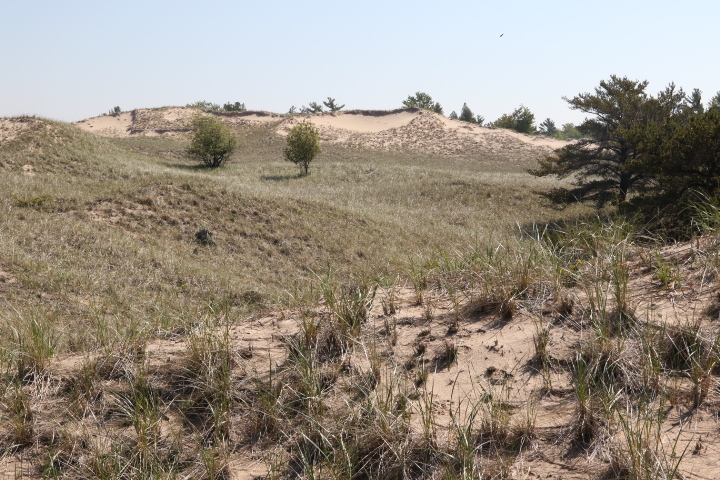 Our first encounter with these dunes was at Saugatuck Dunes State Park. The inland dunes there were probably close to a hundred feet tall. We saw the word “Dunes” on the sign, so we decided to check it out. 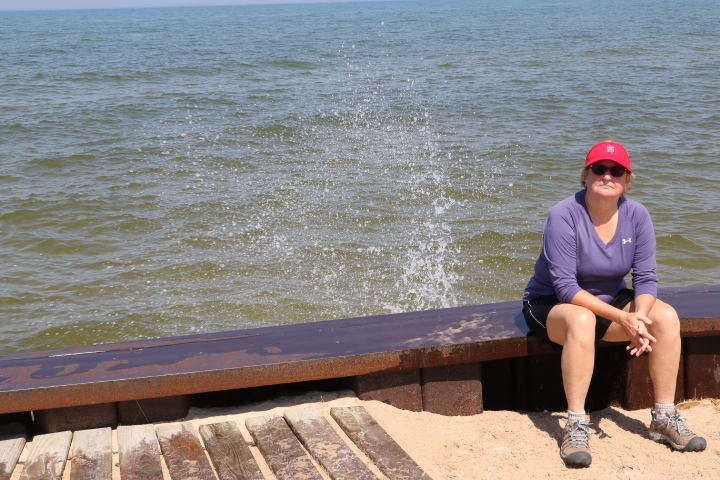 We went for a hike of a couple of miles that led us through the dunes to Lake Michigan. 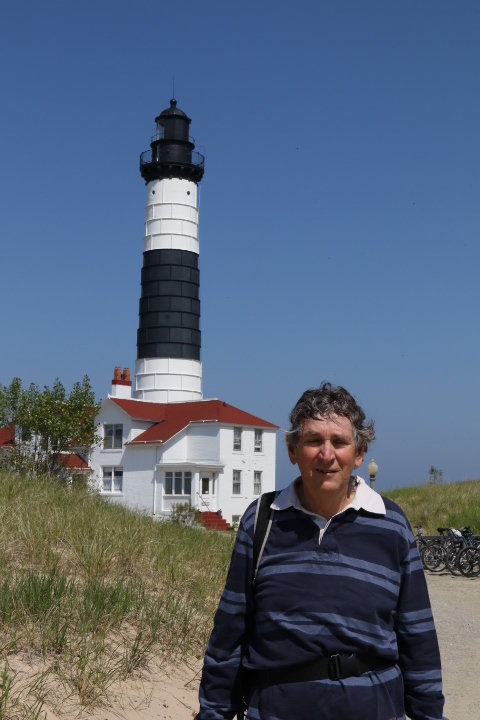 Our next stop on the way to Ludington was Holland, Michigan. The drive into town was through a neighborhood of elaborate houses on some kind of inlet. Once we got to town, the first thing we encountered was road construction closing the main intersection of the “quaint” part of Holland. We did find our way to the New Holland Brewing Company. The road out of Holland was brutal. It was suggestive of the source of the strip shopping centers that have taken over the Triangle. 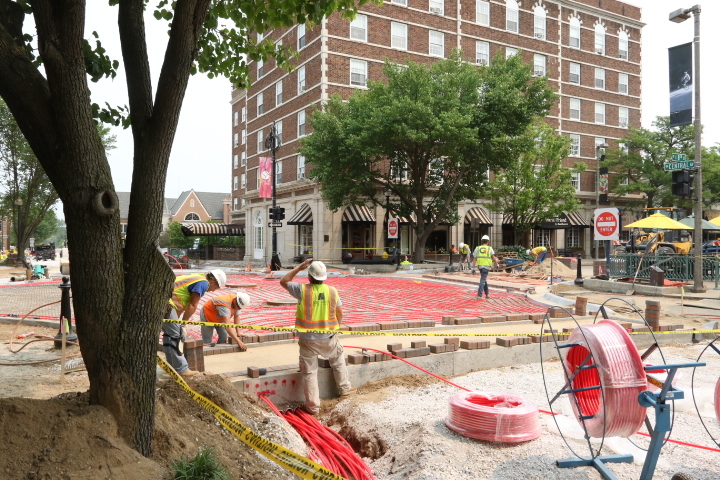 The same stores, even the same “smart” street designs that have befouled the bypass around Holly Springs. The traffic rivaled that of that bypass. We arrived at Ludington State Park a couple of hours behind schedule, in part due to a grocery shopping venture where we left a bag of potato chips and the night’s dinner steaks on the grocery conveyor. The park turned out to be just another awesome example of Bunky’s planning prowess. There are probably 500 “camp” sites (virtually all RVs) tucked amid the trees. There’s an intricate trail system that circles through the inner dunes, with one trail leading tto Big Sable Point lighthouse on the shore of Lake Michigan. That’s a difficult trail (Rebecca labeled it moderate; there were a couple she passed on the way to the light house who, when we caught up with Rebecca, admired her perspicacity). The last mile to the light house was via a sand path; the ups and downs were not dramatic, not more than 30 or 40 feet, but trudging through deep sand for a mile is a challenge. Our bikes came in quite handy. We were able to ride through all three campgrounds, as well as along a path that took us beside a lake and across a dam. The paddling was today’s final event. We inflated the “Sea Eagle” and drove it to one of the inland lakes bordering the park, Hamlin Lake, and paddled about for an hour or so. We actually have another Class B camper (a Mercedes) in the spot next to ours. Camper vans are exceedingly rare so far on this journey.